South Brittanny. – Dirty wet dog , boats and sailing. This is a retrospective post mostly about my last trip in the Frances 26 : the trip that was intended to be my 3 month retirement cruise. It didn’t work out that way partially because i was rushing to get the post flooding refit finished and eventually because i had to get back to the UK to finish negotiations on the place where we now live. I did get 6 weeks great sailing after a solo crossing from Falmouth to Aber-Wrach : took me 40 hours in light winds and i was decidely fuzzy when i had to make the confusing entry into that place across a surging spring tide. I have a great affection for southern brittanny as it was the finish of the first major ofshore race that i crewed in many years back and that landed in the delightful port of La Trinite : strictly speaking that isn’t in brittanny at all but the next department along although i think of it as the same. Getting to this area from the Uk has several challenges in that first there is a longer channel crossing from one of the western ports, then there is the strongly tidal ‘corner’ that includes L-Aber Wrach and the chanel du four and a final sting in the tail with the Raz De Seine. Even half way down the chenal du four though the area starts to feel very different to the more austere north brittanny coast : Morgat for example feels more like a port on the French riviera. Here then are just a few of the highlights from my cruise and some photographed anew during a camping trip last year. The river upstream of the entrance at L-Aber Wrach. At anchor in the Fleuve Odet above Benodet : lovely place and a great river which i explored almost up to Quimper. I did try and find the pool where the late and great Eric Tabarly kept Pen-Duick 1. I think i found the entrance but it would need local knowledge to get in there. The tiny drying harbour at Pont-Aven , an older Folkboat was alongside the quay ‘taking-up’ its seams : this would be great place for a boat that will take the ground easily. The wild surf beach at Guidel which faces out into the bay of biscay : the next major port around here is Lorient to the east. There is a tiny drying harbour just along the coast here but mainly used by small fishing boats. 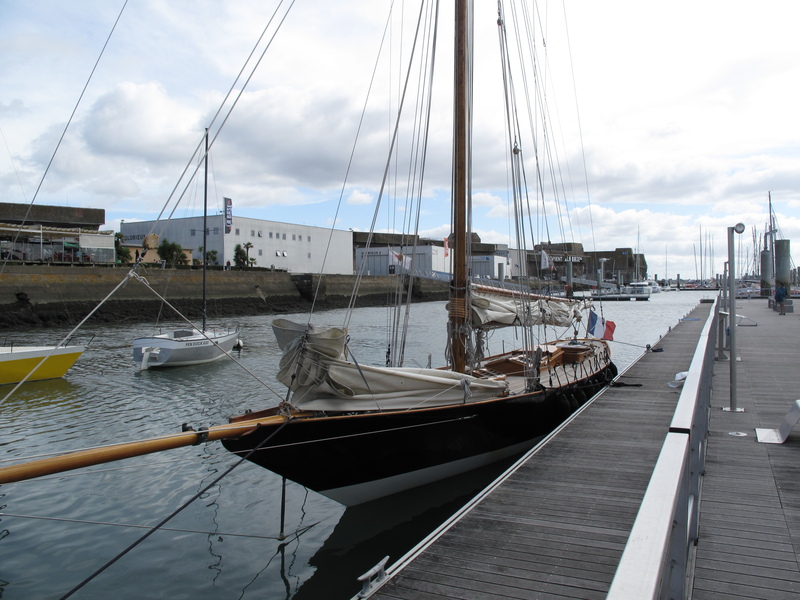 Lorient base and the Eric Tabarly museum with Pen-Duick 3 alongside. lorient town itself must be just about the dullest city in the whole of France but the port is useful and the base well worth a visit. The base is actually the site of the former German U-boat pens which are almost entirely intact and now contain both the submarine museum and a museum of undersea exploration. Sometime i have a plan to take a wayfarer dinghy down there and dinghy cruise along that coast : i really want to get into the Morbihan which was my destination for the cruise which i didn’t have time to complete. The tiny drying harbour at Guidel. Next The FFS 17 and a bit.